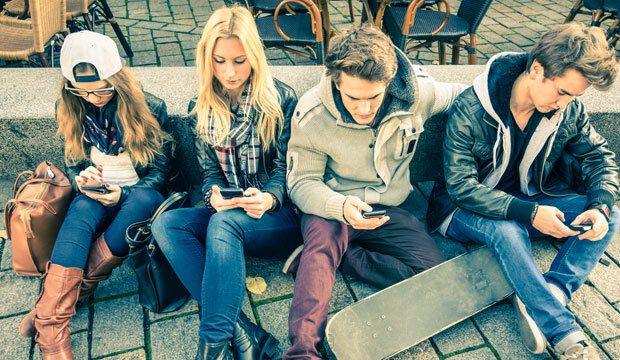 Parents don&apos;t need a poll to tell them their teenagers are addicted to smartphones. After all, smartphones are a permanent fixture rather than accessories on the visages of kids of all ages these days. Even so, polls move these everyday observances from anecdotal to official problem when the numbers tilt in that direction -- and a Common Sense Media poll hit full tilt. The fact that 59 percent of parents said their teens were addicted to mobile devices was not surprising. However, the fact that 50 percent of teens admitted they were addicted was shocking. While parents feel uneasy about their kids constantly being tethered to a device, most are not sure what real harm tech addiction does to teens. It turns out that it has multiple ill effects. Empathy, the ability to understand and appreciate the feelings of other people, is a trait that is essential to the well being of society. Empathy is the reason people are kind to each other, donate to helpful causes, and avoid harming other people and their possessions. When empathy is diminished or absent, the opposite often occurs -- and criminal behavior can spike. Preteens who were deprived of screened devices for five days dramatically improved at reading people&apos;s emotions (nonverbal skills) compared to children who continued using screens, according to a UCLA study. Reading someone else&apos;s emotions correctly is a function of empathy. Without empathy and human connection, young people can become cold and cruel to others. Then, when they encounter cold and cruel responses from other young people, the cycle perpetuates itself and grows. "Lack of empathy seems to be a forerunner among cellphone users," suggested Chantale Denis, a clinical social worker and sociologist. "Whether users are addicted or not, cellphone use can perpetuate a lack of accountability, breed irresponsible behavior, feed malevolence, and retard the ability to effectively nurture social skills inherent in our civility to be kind, thoughtful, caring, loving and understanding," she told TechNewsWorld. Smartphones summon information and entertainment on demand. Thus, instant gratification becomes a constant expectation on and offline. "Smartphones and computers socialize us into a pattern of communication that then carries over to our everyday non-tech communication lives," observed Psychsoftpc CEO Tim Lynch, who holds a Ph.D. in psychology of computers and intelligent machines. "We expect answers right away, become impatient, use shorter sentences, get right to the point instead of engaging in small talk, and can ignore feelings of others in expressing ourselves," he told TechNewsWorld. This lack of soft skills, which include people skills and critical-thinking skills, can interfere with getting a job and with getting promotions. "Socializing and building authentic relationships in real life with others is a muscle," said psychologist Wyatt Fisher. "The more we use it, the better we get at it," he told TechNewsWorld. "The reverse is also true. Therefore, as teens interact primarily with people through a screen, they often lose the skills needed to connect in person." Smartphones offer young people more access to the world, but they also give more of the world access to young people. Without buffers and filters, teens and preteens can be influenced in all the worse ways. Researchers reported a strong association between heavy Internet use and depression in a National Institute of Mental Health study. They also observed a link between heavy Facebook use and depressive symptoms, including low self-esteem. It&apos;s not just the constant barrage of posts, texts, and messaging from peers and bullies on smartphones that can have a negative effect on the mental health of young people. "Teens are in the stage of development where they still do not have a strong sense of identity, so by constantly being on social media, they are effectively exposed to ads and models that promote unrealistic bodies or body weight," he told TechNewsWorld. "Ultimately, these ads negatively affect younger people&apos;s mental health due to the skewed representation of beauty or lifestyles that align with the products and services of many companies." Most experts advise parents to encourage their children to limit the time they spend online. "Put down the phone" has become the new "go play outside." The key is to help kids find balance in their activities. There are specific steps parents can take to achieve that balance, said Lynette Owens, global director of Internet Safety for Kids & Families. Talk about it. Don&apos;t just lay down rules -- discuss smartphone use with kids and explain why they need to seek balance and do other things. "Help your child understand technology isn&apos;t bad," Owens said, "but ask them, &apos;do you control it or does it control you?&apos;"
Set boundaries. Be smart and practical about it. "Not all online time is equal," Owens said. "Sometimes kids simply have to be online for schoolwork, and other times, it&apos;s for fun. It&apos;s the latter that needs some boundaries." Consider forbidding devices at the dinner table and leaving them outside bedrooms after bedtime. Set a good example. Put your own devices down. Model what you preach -- it could be good for you. After all, many parents also are addicted and need to regain their life balance. Twenty-eight percent of teens think their parents are addicted to their mobile devices, and 69 percent of parents admit to checking their devices, at minimum, every hour, according to the aforementioned Common Sense Media poll. Help them find balance. Offer alternatives or suggest other activities. Find some activities that they can do alone, some they can do with friends, and others they can do with parents. Again, the keyword is "balance." Technology is not going away. If anything, it will become more pervasive. The key is to ensure that tech remains a tool -- a servant and not a master. By staying aware of your and your kids&apos; use patterns, you can keep tech tools in their rightful place.